Do UFO's (Undentified Flying Objects) really exist? We can answer this one with a definitive YES, in the high desert anyways and this is confirmed through the knowledgeable expert ancient astronaut theorists who say YES. Reasons become clear as to why we actually see UFO’s more then say, people in the big cities. Look there are many unexplained current and historic sightings in the dark, clear skies in rural towns and communities all across these desert communities, in particularly places nearer a military installation like we are near a few here in the Morongo Basin. The military activities around the Yucca Valley might be in part a cause for some UFO sightings. A visit to our area in the desert would explain a lot about UFO sightings, because it is dark and clear and you tend to be outdoors more because of the annual favorable weather conditions and with little to look at other then a desert tortes making its way across the desert sands, we do tend to veer skyward in the evenings looking at the amount of planets, suns and stars and from time to time, once or maybe twice, in our case, we saw something we could not identify so that is an unidentified flying object, a UFO sighting. What is desert boom sand, it is located near Baker in San Bernardino County and within the Mojave Desert, these rising sands stretch 45 square miles in area. These dunes reach heights of 400 feet 650 feet sometimes 700 feet above the surrounding area topography. Sand dune heights vary as the winds blow, rainfall though rare changes heights as sand dunes are not stationary objects and are extremely unstable, subject to flows slides and continuous movements. These sands are the result of weathering as the material of the sand is mostly quartz and feldspar grains eroded from granitics from the nearby San Bernardino Mountains. Named the Kelso Dune field, Dumont Dunes are near Devils Playground, Death Valley. The dunes make continuous noises, vibrations, even booms to no current understanding from geologists as these sounds are likely driven by wind movement sing with sounds like an aircraft propeller or the hum similar to those of high power electricity transmission lines produce. These sounds have and are heavily studied as they have been dated back hundreds of documented years with no definitive answers to date. In the west end of town along State Route 62 our main highway, we do have a small road splitter or divider where a park named Triangle Park dedicated to our Military Veterans it is also known as Remembrance Park. 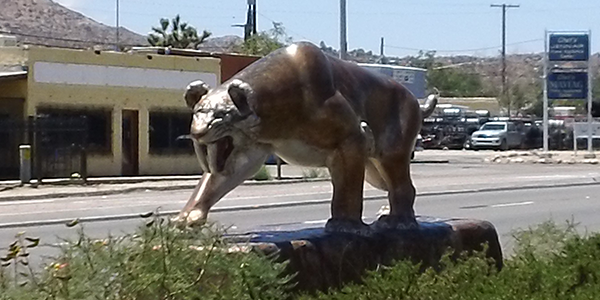 The park has a sculpture titled “Saber Tooth Tiger” in this park by Smilodon, it is gold in color. Active Atom is located 359 miles southwest of Lincoln County, Nevada home to the US Air Force Base named Area 51. 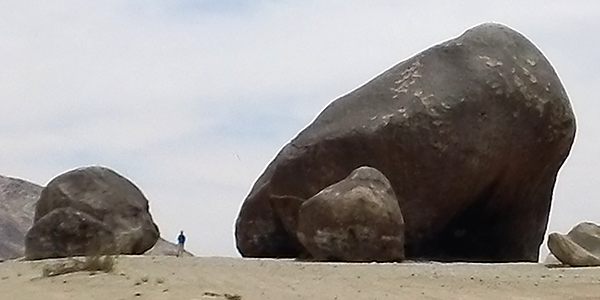 Yucca Valley is near a place named Giant Rock, that was once a single massive granite rock, that as of the early morning hours of February 23, 2000 is now two giant rocks (still believed to be the worlds largest free standing boulder) that sits alone, yet it is located next to a mountain of smaller rock formations. UFO meetings in the not so distant past were held at Giant Rock which is 58,000 square feet in size and seven stories tall. Giant Rock also sits next to a natural granite rock airstrip near Landers California and was the home of a prospector that burrowed a home underneath it to live his life in however, the Giant Rock is best known as a UFO Meeting place or those that came to see the rock and share UFO tales and sightings with others starting in 1953 and this ran through 1978 drawing 10,000 people to the events named the Spacecraft Convention. There is in addition to these types of UFO enthusiast events Contact in the Desert and there is the permanent Integratron built in 1959 as a 38 foot tall by 55 foot diameter dome near the off-road entrance path leading over to Giant Rock. Joshua Tree Retreat Center aka The Institute of Mentalphysics. Serving its desert visiting members since 1941. 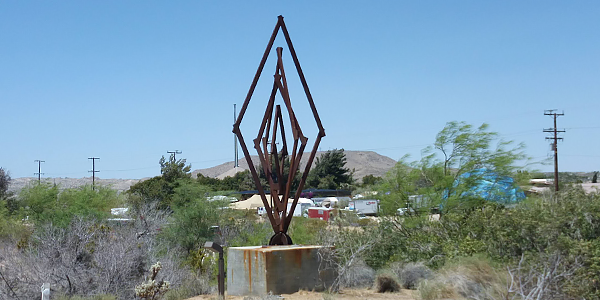 There is also one alien encounter a location right on the main highway State Route 62 in the east end of Yucca Valley and ironically it is on the same north side of the main highway as Triangle Park in the west end of town. Please meet a place located all by itself, a campus able to accommodate 250 people located on 385 acres. A note about this giant strange looking shaped campus is from that of a young child named Lance Conway riding in the car out to see is granddad Alvin Conway and wife Penny, we would pass this campus and I would always remember it has no square points some triangles and other odd shapes to accomplish the same building completion goals. Some property locations are not just places of meditation and heeling, but are energy vortices, through the powers of the native land and many Joshua Trees spiritual teachers linage. This place is known to hold alien encounter knowledge and many tell of UFO sightings and alien phenomena.